Legend has it that on a cold night in the month of October 1498, Doña Lucia Sanchez de Baeza, a lady of high rank, possessor of large villages in Carmona and definitely the church-going type, visited the old Chapel of Santa Maria la Real, where she prayed every night, and got locked in while she was praying devoutly. She started to sob and begged the Virgin to grant her a miracle. She didn’t want her husband to notice her absence, because that event could cause serious disputes and mistrust, so she promised the Virgin that if she granted her this miracle and if her husband should die before her, to found a beautiful convent around the chapel from the proceeds of selling all her possessions. The next day when the chapel was finally open, she went home and was shocked to see that her husband hadn’t noticed her absence of the previous night. This was the origin of the Convent of the Immaculate Conception of Carmona, founded in 1510, once DoñaLucíaSánchezBaeza had become a widow. “Makulata UG” wants to render tribute to the nuns who have lived and worked in this cluster for more than 500 years, constantly practicing the three virtues of the Inmaculada Concepción “love, forgivness, and forgetfulness” and sweetening the palate of the Carmonens with their delicious pastries. Our Makulatinas are made with rural products from the countryside of the ‘Alcores’ bordering the ’Vega of Carmona’. These products were already used in the middle ages for making sweets at the ‘Convento de la Concepción’. 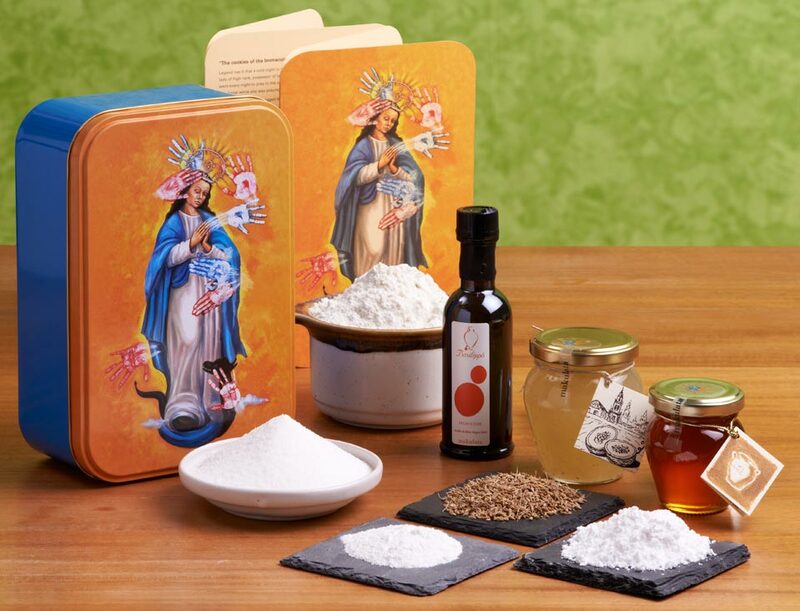 We sincerely thank Sister Concepción, Sister Lourdes and Sister Beatriz for offering this wonderful recipe, preserved through the centuries by the dainty hands of the nuns. The image of the ‘Immaculate Conception’ that decorates our box is inspired by the original mural left in the Convent. It’s an offering by the painter from Carmona – Manuela BascónMaqueda – to the eight Conceptions Sisters, who, due to the deterioration of this wonderful Convent, had to move to a newly built convent in 2005. The Hands on the image symbolize the spiritual alliance that will exist between the memory of that convent and the citizens of Carmona. Enjoy these wonderful traditional cookies and the culinary baking virtues of the Convent: simple, tasty and healthy.